There are many species of Maples (circa 150 sp) - Sycamore (Acer pseudoplatanus) and Field Maple (Acer campestre) are 'typical' Maples. All have leaves arranged in opposite pairs around the stem - usually with 5 main veins radiating into a 5 lobed leaf. Seeds are dispersed in a winged fruit ('keys' / helicopters). 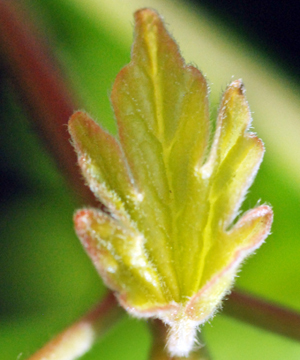 Leaf shape, the teeth and hairs on the leaf are important features in distinguishing Maples. 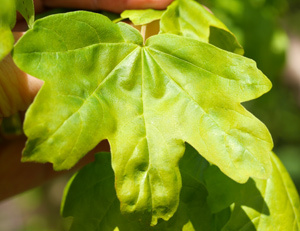 Field maple is more a tree of hedgerows, rather than a true woodland tree. It is to be found in the rich / chalky soils of the southern half of the U.K but is frequently planted. It can grow to a considerable height (20 metres). It is a native tree, unlike the sycamore which was introduced When in leaf and mature, the overall outline of the leaf canopy is rounded / ball shaped. The leaves are arranged in opposite pairs along the twigs. Unlike the related sycamore, the leaves are not massive. There are three main lobes to each leaf (which are rounded at the end), and two smaller, basal lobes. Mature leaves are quite a dark green. The adjacent images are of newly emergent leaves; when they first emerge the leaves may have a slight red tinge on the margins. In Autumn, the leaves turn an amber - yellow colour, bringing a distinctive 'glow' to hedgerows as winter approaches. 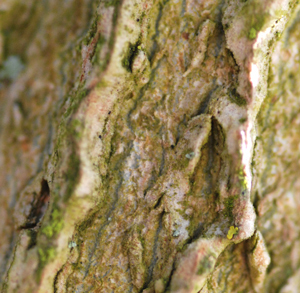 The bark is grey to light brown, which is marked with fine, shallow fissures. 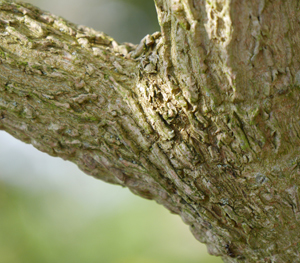 Ridges develop from an early stage, as does a 'corky' appearance. The wood used to be used to create "bird's eye maple" for furniture veneer; it was also used in the making of musical instruments (violins). The ends of the main branches droop down and then turn up at their ends. Young shoots / twigs are thin and have a pale brown colour. After a year, they have a more 'wrinkled' appearance. The crown of the tree is densely 'twiggy'. The fruits or keys when they develop have a green / red colour. The fruit is a double samara. A samara is a winged single seeded fruit (achene) that develops a flattened 'wing' of papery / fibrous tissue from the wall of the ovary. Its structure is similar to the familiar 'helicopters' seen on sycamores - but the wings are arranged almost horizontally. The wings assist in the dispersal of the fruits / seeds. Not available at present, opposite is an image of bud burst in Spring.